Outstanding level of image quality. Handles up to 550 lbs. 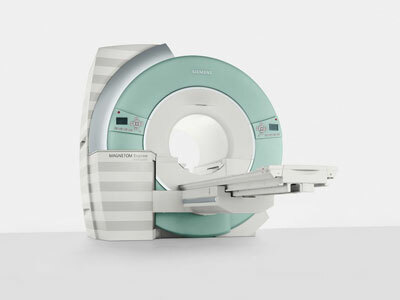 MAGNETOM Espree with I-class offers a spacious 30 cm (one foot) of headroom and a 55.5 cm (1’10”) patient gap. That means: More headroom, more legroom, more elbowroom. No longer will the patient feel like they’re nose-to-nose with the magnet. Particularly claustrophobic or anxious patients are more relaxed throughout their examination. Feet first and heads out for most exams. Thanks to MAGNETOM Espree’s short 125 cm magnet, 60% of all applications can be done with the patient’s head outside of the Open Bore. So for everyone 157 cm (5’2″) and taller, every scan below the chest can be done that way. Also, your patients will enjoy the most open lumbar scan in the market. This is CT-like comfort married to true high-field power which wasn’t possible before in any conventional Open system. We’ve lightened the load. For everyone. For example, our Body Matrix coil weighs only 950 grams (33.5 ounces). Significantly more comfortable, especially for sick patients. There’s also no need to invest in a separate set of dedicated coils for obese patients. That’s because with Tim and the flexibility of the Matrix coils, you can combine the coils in the vertical, as well as the left-right axis. With Tim (Total imaging matrix), MAGNETOM Espree offers superb imaging performance. Your staff and patients benefit from more flexibility, accuracy, speed, and diagnostic confidence. MAGNETOM Espree helps to diagnose extremely challenging diseases with a high level of confidence. It facilitates the evaluation of complex pathologies and difficult patients. In each clinical field, syngo® MR applications, powered by Tim, are helping to create the future of MRI. MAGNETOM Espree offers a high level of flexibility with innovative applications for each body part. And with Tim you can seamlessly scan up to 205 cm with no patient repositioning or coil changes for true whole-body functionality.